Cobblers defender Joe Bunney is on the move after signing a season-long loan deal at Sky Bet League One side Blackpool. The 24-year-old was signed by Jimmy Floyd Hasselbaink in the January transfer window, with Town paying an undisclosed fee to Rochdale for his services. After a bright start to his Cobblers career, and goal assists in his first two games against Milton Keynes Dons and Blackburn Rovers, things didn’t go quite so smoothly for Bunney, and he lost his place in the team in March. 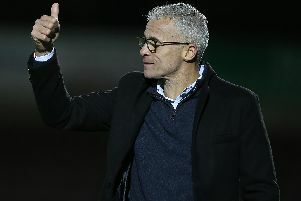 Bunney’s final action for the club was in the 2-0 derby defeat at Peterborough United, which was also Hasselbaink’s final game in the charge, with the player not featuring in any of Dean Austin’s five caretaker matches at the helm. And Cobblers boss Austin feels it is better for the player, and the club, that he tries his luck elsewhere. “Joe wasn’t playing in the side at the end of last season,” said Austin, who picked David Buchanan at left-back in all of his games in charge. “He has been offered this opportunity to go and play at Blackpool and he has handled things the right way. “He said to us that he would like to take this opportunity and we felt it was a good move for us both at this time. In all, Bunney made 11 starts and one substitute appearance for the Cobblers last season.